How have you all been? I hope you all enjoyed the bank holiday – for those of us based in the UK we were blessed with three days of brilliant sunshine. I’m aware I have not posted an Indian recipe for a while so I hope that this one will greatly please you. 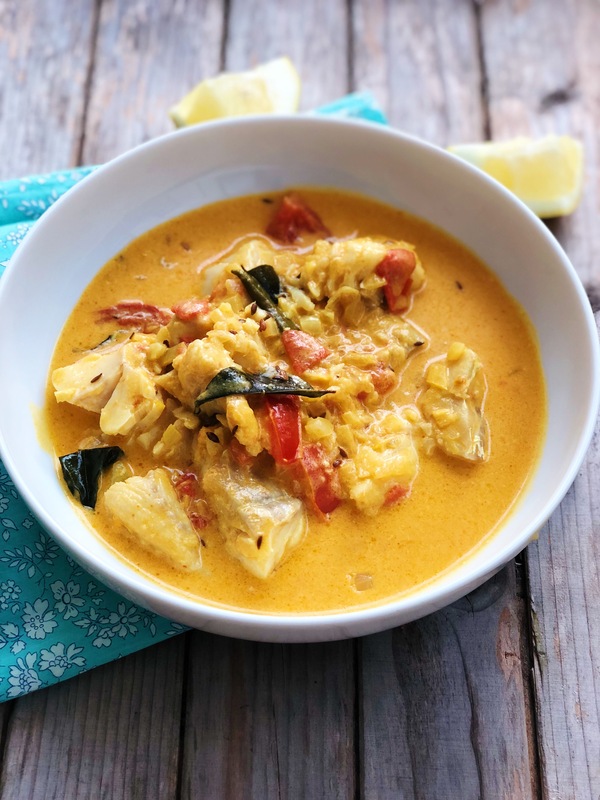 If your spice cupboard is fairly limited and you want a quick but satisfying curry, then this mild cod curry definitely ticks the box. 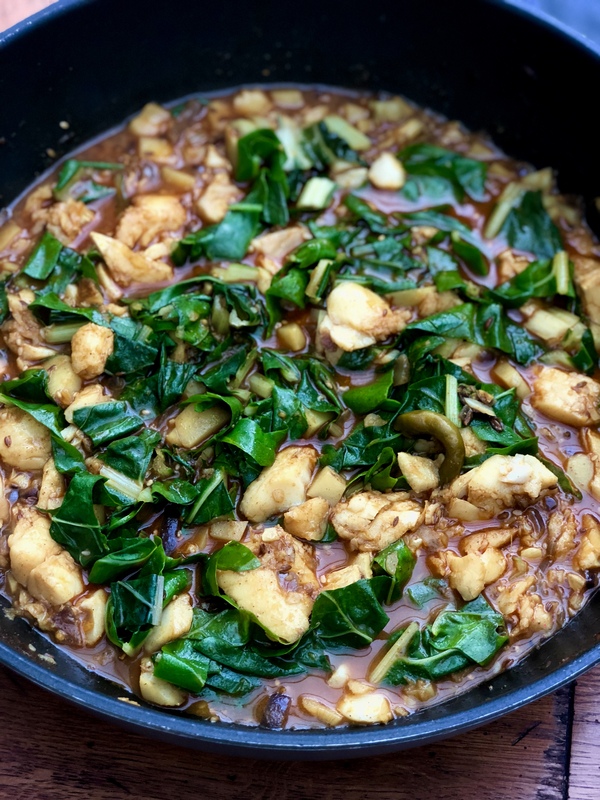 It’s a crowd pleaser for the whole family as it is only delicately spiced and the one fresh chilli that I do add, I make sure it does not go onto the plate of any unsuspecting guest or family member. I adore purchasing fresh curry leaves from my friends down in Tooting, but I find that they freeze really well, so I always have a good supply ready to use. If finding fresh is tricky, then dried will be a good stand-in, although fresh is ideal. Add the oil in a large non stick wide pan and when it is hot add the curry leaves, cumin seeds and turmeric powder. Move around the pan for 20 seconds before adding the onion. Gently cook away for 6 minutes before adding the garlic and ginger past. Cook for a further 4 minutes. Now add the tomatoes, tomato paste, salt and sugar and simmer gently for a few minutes. Add the coconut mild and let it simmer for a few minutes before adding the cod pieces. Continue to simmer for up to five minutes with a lid on the pan, stirring gently once or twice. You do not want to break up the cod pieces so be careful. Take off the heat to rest. Serve with rice or paratha and some fresh lemon on the side. If you want some accompanying greens this recipe is great and super quick. Being an island nation we tend to be more conscious of our seas and the fish within them than perhaps landlocked countries. That said I have always wondered why, like the Japanese, we don’t eat more fish in our diet. Growing up my parents would always have fish on Friday, which was pretty typical of Christian families of their generation. Today however, I don’t wait for Friday to have fish and on average we probably eat seafood a couple of times a week. 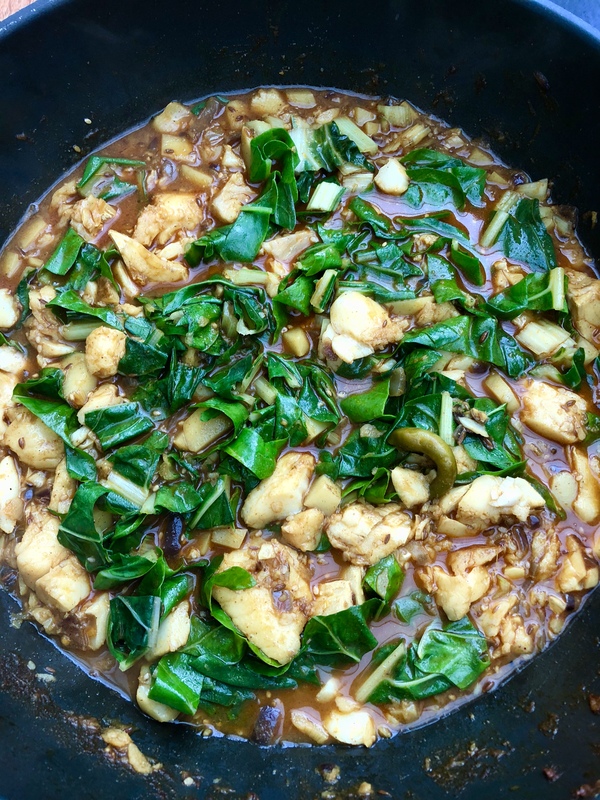 I try to be as innovative as possible (see here for my post on foraging for cockles) in the way that I prepare and cook it. 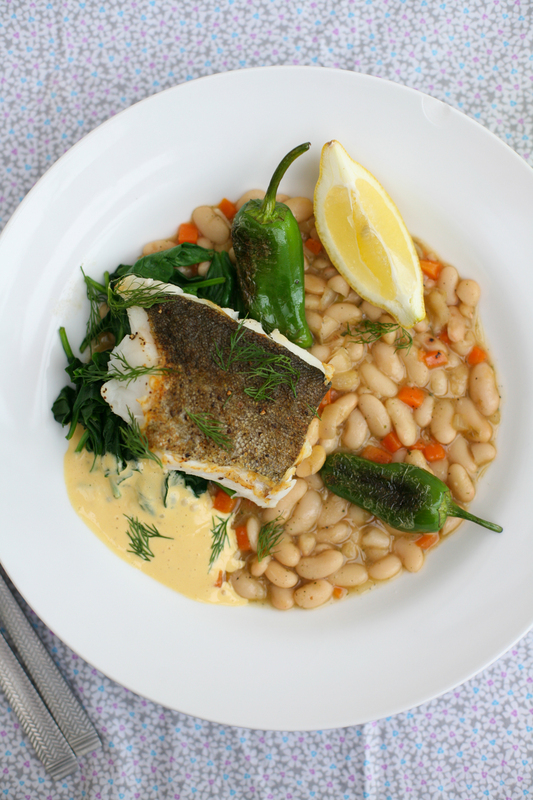 Grilled or baked fish with a squeeze of lemon or fish pie is all very delicious but there are so many other ways to cook seafood that I hope the recipe that I will show you today will encourage you to give it a try and that it will become part of your culinary repertoire. Recently I was contacted by LOAF App, (short for ‘love of all food’), to come up with an exciting recipe focusing on the theme of ‘fusion’ that will go onto the app and be part of a competition (more about that in a moment). 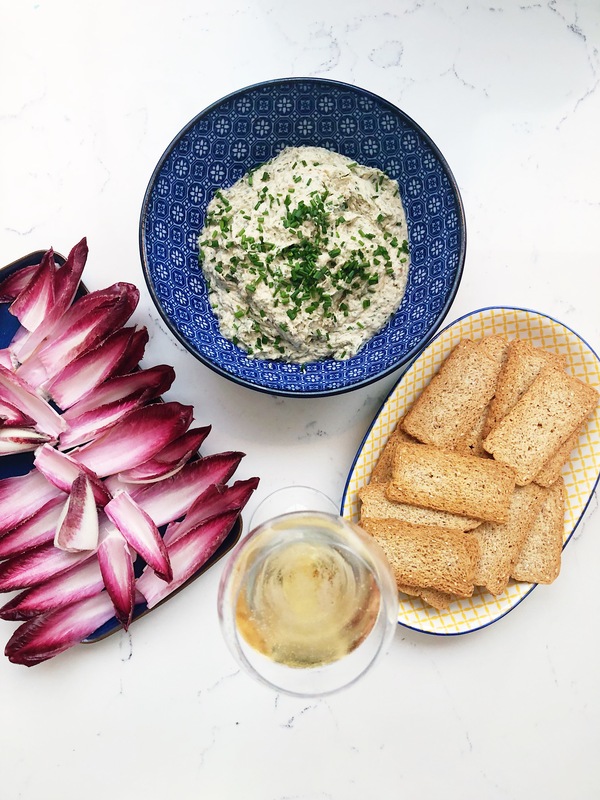 For those of you who have not yet heard of LOAF, it is a fabulous new recipe app, that is free to download, that has a wide range of recipes from bloggers and chefs, in a standardised format that is easy to follow and replicate at home. You can even add your own recipes and share them with other users. (Write ups on the app here and here). 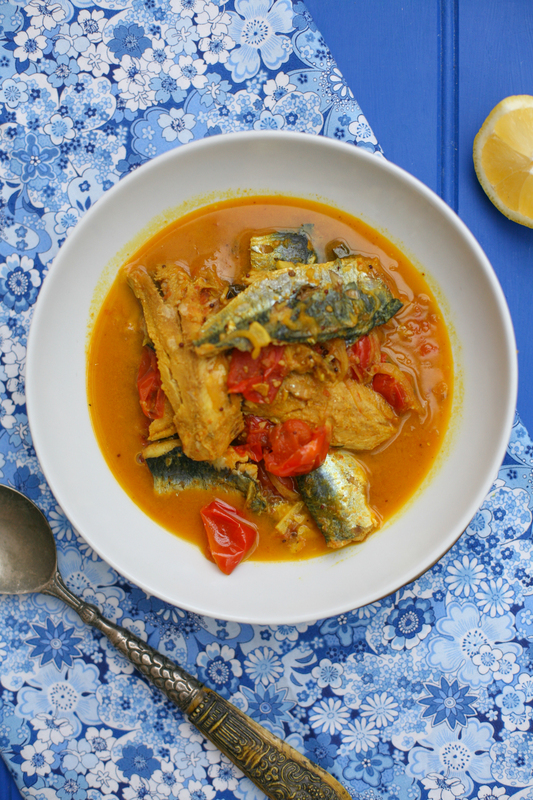 LOAF is working in partnership with the MSC Fisheries Standard (Marine Stewardship Council) on an exciting campaign, which gets the public cooking whilst being more informed on which seafood we should be buying. As part of the competition I have focused on fish that has the MSC Fisheries Standard blue label (see photo above). My recipe is now live on the LOAF app site for you to cook at home. You then need to photograph your efforts of my recipe, put them up on the LOAF site and I will then judge the winner of who I think made my dish best. The winner will be awarded £75 worth of free food shopping from either Sainsburys (UK), Wholefoods (US) and Coles (Australia). 85% of the worlds’ seafood are either at capacity or over fished. Buying seafood therefore that has the MSC blue label sticker on it is something that we all need consciously to do if we are to protect our oceans for future generations. The label tells the consumer that the seafood product you are buying is ‘certified sustainable seafood’. Fisheries are assessed to check if they are well-managed and sustainable. I urge you to look at the following Youtube video explaining the Fisheries Standard’s principles and scoring. The standard has been developed in consultation with scientists, the fishing industry and conservation groups. Today we are all more conscious of food origin and therefore by buying MSC blue label food is a no brainer as it is fully traceable to a sustainable source. The MSC Fisheries Standard have also put together a product finder so that you can find sustainable fish and seafood wherever you are in the world. Take a look here to see how it works. So the recipe that I have come up with takes 15 minutes max to prepare and half of that is making the paste. It’s origin is from Kerala and I recently watched a similar recipe being made. I have been doing something similar for years, albeit without the coconut addition. It is steamed as opposed to baked, grilled or fried. If you want to be truly authentic you can source a banana leaf to wrap it in, failing that baking parchment works just fine. Rice would be perfect to accompany this dish. So what are you waiting for? Give it a try and post your photograph up on the LOAF app site. EASY. Put all the paste ingredients together in a blender to make a fine paste. Add salt to taste at the end. Cut the baking parchment so that it wraps over the cod loin completely. Place the paste all over the top of the fish and lay it in the centre of the baking parchment. Carefully wrap the fish so that the ends are completely enclosed. Warm a frying pan (or Indian tawa if you have one) and when it is hot lay the cod parcel onto the pan. It will cook by the steam that will be created within the parcel. After 4 minutes turn the fish parcel over for another 4 minutes. If it looks as if it needs a little longer leave it for another minute and it should be ready. Note: You can also use banana leaf instead of baking parchment. If using a banana leaf you need to hold the leaf carefully over a gas flame in a sweeping motion so that it softens. Do this on both sides and then cut it down to size so that the fish can be completely covered by the leaf. You can bake the fish in the oven (180 degrees) for 15 minutes if you prefer but I suggest wrapping the fish in baking parchment papillote style – see here so that it does not dry out and steams itself whilst cooking. Don’t you just love those recipes that require minimal effort to achieve a very satisfying and tasty result? 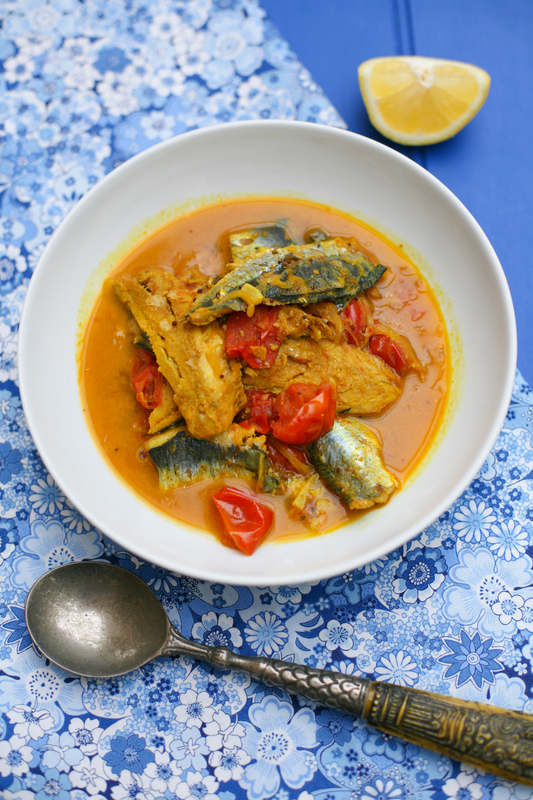 This south Indian sardine curry is one of those dishes. 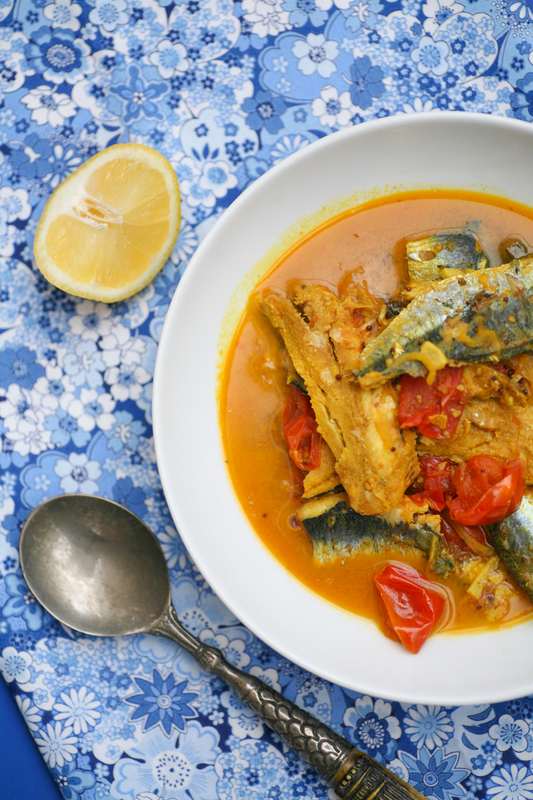 Sardines are great fish to have in your diet as they are packed with essential nutrients, including omega 3 fats, vitamin B12 and vitamin D. They are also very reasonable to buy and therefore are within everyones budget. The bones too are so small that you can easily eat them along with the flesh, providing you with calcium. I sometimes like to keep the sardines whole and at others times have them filleted. This recipe works equally well, whichever way you like to prepare them. If you are going to get them filleted your fishmonger can easily do this for you to save time. You could also add tamarind paste (no more than a teaspoonful) to this dish to give it a different twist. If you do decide to do this add the tamarind at the same time that you add the tomatoes. 1. 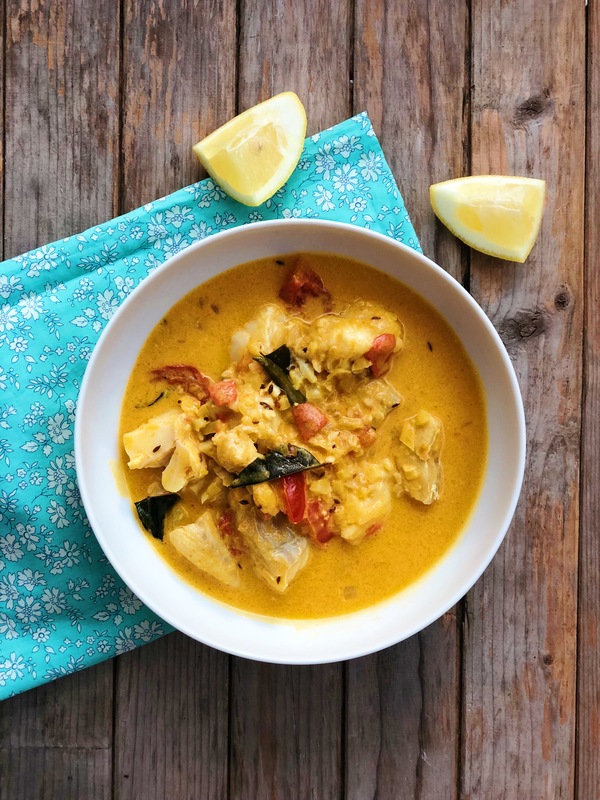 Heat the coconut oil and then add the mustard seeds moving them around the pan for 15 seconds before adding the curry leaves. After a further 10 seconds add the shallots and salt. 2. Allow the shallots to soften slightly on a medium low heat for 4-5 minutes before adding the garlic, ginger and chilli, followed by the turmeric and coriander powder. Cook for a further couple of minutes. 3. Add the tomatoes and stir into the other ingredients. Place a lid on the pan and cook for around 5 minutes to allow the tomatoes to soften. 4. 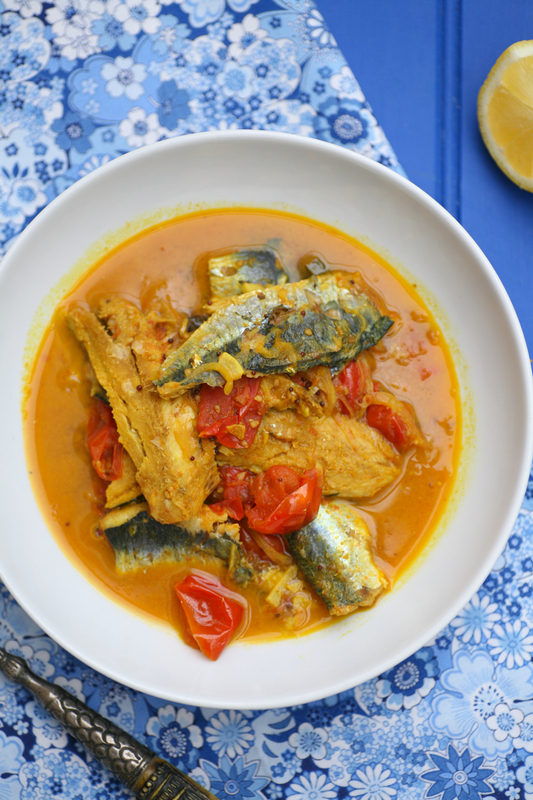 Add some of the water and stir into the ingredients to create a sauce and then add the sardines and cook on a low heat for around 5-7 minutes with the lid on the pan. Do add more water if you require more of a sauce. 5. Careful not to over stir as the sardines will break up. Not so long ago I had a really memorable lunch at Vinoteca in Farringdon. It’s a really relaxed, unstuffy little restaurant with wooden floor boards, a huge (285 if you want to get precise) selection of wines to drink there or buy to take away and a very fine menu of seasonal tasty food. 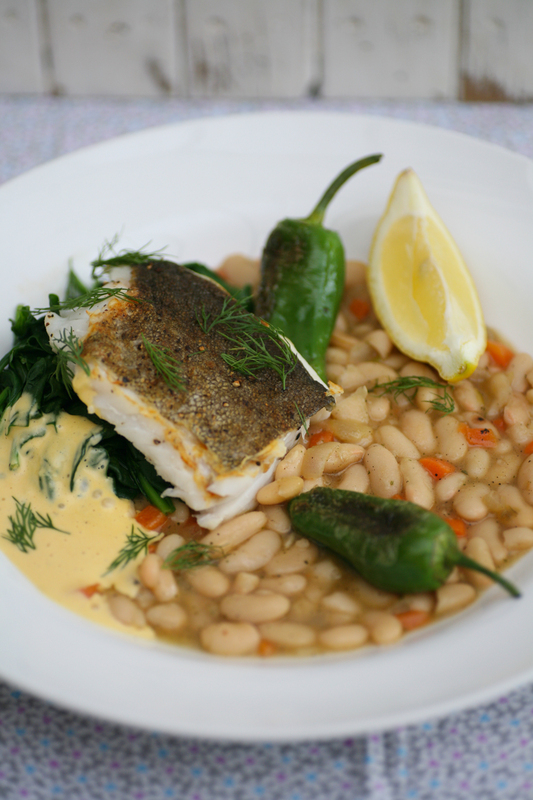 I had this wonderful hake and beans dish with pardon peppers, spinach and aioli and flecks of dill. It was SO good I swore I would replicate the dish at home and share it all with you. For the fish connoisseurs among you you will notice that I have replaced hake with cod. My preference would have been to use hake but as I had recently bought cod to make cod fritters I decided to use that up instead. 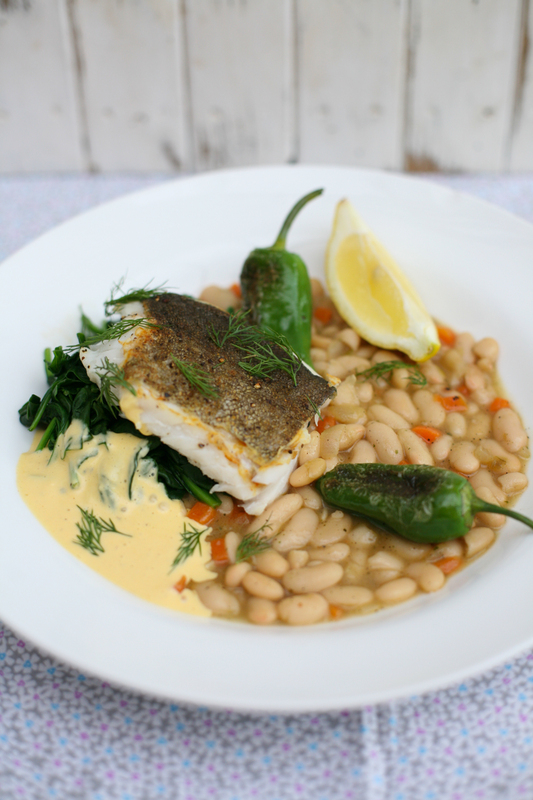 If you can find hake however I would suggest using that as it holds together far better than cod, which tends to be flakier. In fact any firm white fish would work well. The hardest parts of this dish are making the aioli which can be tricky. In an ideal world I would have liked mine a little less runny but the taste and creaminess were spot on. Cooking fish can also be tricky as you want it to have crispy skin and for it not to dry out. You want to make sure the fish is completely dry before cooking so place it on kitchen paper and then add a splash of oil to the skin and season with salt and pepper. Heat a non-stick pan and when it is hot place the fish skin side down for around 4 minutes and then turn over and cook for a further 3. You then should remove from the pan and let it rest whilst you plate up the rest of the dish. If it breaks up, don’t worry it will also taste great in pieces within the beans instead of on top of them. Padron peppers are available right now in the larger super markets. They come from Southern Spain and Morocco and complement this dish really well. They take a couple of minutes to cook so are quick and easy to prepare like the spinach. A lot of my blog followers have told me how much they love my ‘chickpea, chorizo and cod stew with fresh parsley‘ so I hope that this one will also become one of your new go-to recipes. 1. In an electric blender or whisk, blend the garlic, egg yolk, salt, water and pepper together. Then add the Dijon mustard and blend again. 2. Then add the oils a teaspoon at the time, continuing to whisk as you do so. Keep doing this until the sauce has thickened and emulsified. Taste and add more lemon or salt as you require. Place in the fridge until ready to use. 1. Heat a pan and add the olive oil and when it is hot add the shallots, carrots and salt on a medium heat. 2. After 5 minutes add the garlic and cook for an extra couple of minutes before adding the white beans (including the water they are in). In addition add the extra boiling water and a vegetable stock cube. 3. Simmer on a low heat for up to 10 minutes, adding more boiling water if it becomes too dry. 4. Meanwhile heat a different non stick pan. Clean each portion of fish and pat dry with kitchen paper. If it has skin place a little olive oil onto the skin along with a pinch of salt and pepper. When the pan is really hot add the fish skin side down for around 4 minutes. Do not move the pan of fish for this time as it will make the fish fall apart. After 4 minutes, gently flip the fish over and cook for a further 3 minutes. Take off the heat and leave to rest on a warm place whilst you prepare the spinach and padron peppers. 5. Using the same pan as the fish add a tablespoon of olive oil and add the pardon peppers. Move them around the pan so that they burn slightly on each side and begin to wilt and soften. This will take around 3 minutes. Place to one side on a warm plate. 6. Using the same pan as the pardon peppers add the fresh spinach and a splash of water and move around the pan for up to a minute, by which time it will have wilted. To plate up add the beans and carrots stew then add the spinach and pardon peppers. Lay the fish on top and then pop a dollop of aioli by the fish and sprinkle some dill over the dish. Add a quartered lemon to each serving. Serve immediately so it is nice and hot.